, an English physician and chemist, and promoter of the royal society, was the son of a rich ship-builder at Deptford, and born at Greenwich about 16 17. Being industrious and of good parts, he made a quick progress in grammar-learning, and was entered a commoner at Magdalen-hall, Oxford, in 1632. He staid at the university about four years, applying himself to physic; and then left it, without taking a degree, to travel abroad, as was at that time the custom, for farther improvement in his faculty. 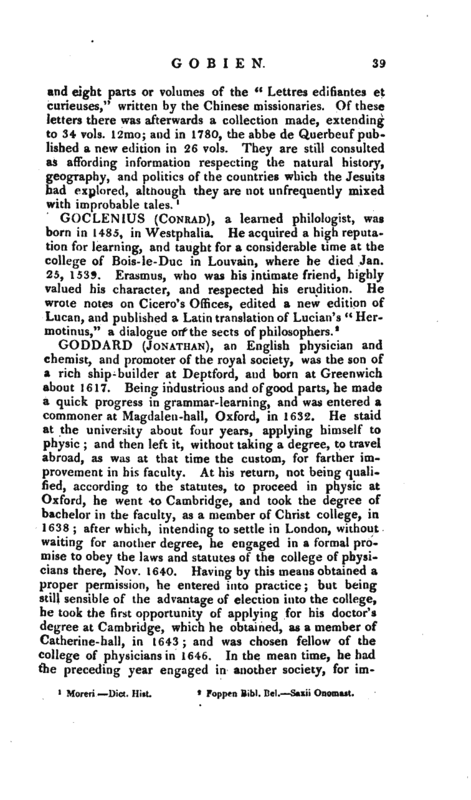 At his return, not being qualified, according to the statutes, to proceed in physic at Oxford, he went to Cambridge, and took the degree of bachelor in the faculty, as a member of Christ college, in 1638; after which, intending to settle in London, without waiting for another degree, he engaged in a formal promise to obey the laws and statutes of the college of physicians there, Nov. 1640. Having by this means obtained a proper permission, he entered into practice; but being still sensible of the advantage of election into the college, he took the first opportunity of applying for his doctor’s degree at Cambridge, which he obtained, as a member of Catherine-hall, in 1643; and was chosen fellow of the college of physicians in 1646. In the mean time, he had the preceding year engaged in another society, for | improving and cultivating experimental philosophy. This society usually met at or near his lodgings in Wood-street, for the convenience of making experiments; in which he was very assiduous, as the reformation and improvement of physic was one principal branch of this design. In 1647, he was appointed lecturer in anatomy at the college; and it was from these lectures that his reputation took its rise. 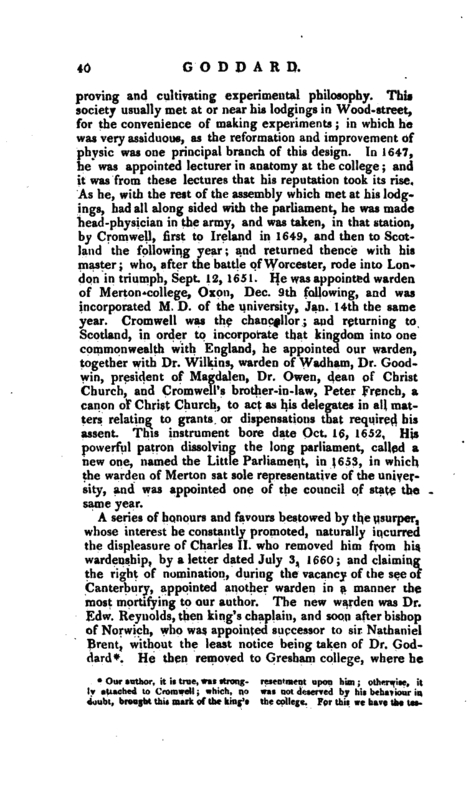 As he, with the rest of the assembly which met at his lodgings, had all along sided with the parliament, he was made head-physician in the army, and was taken, in that station, by Cromwell, first to Ireland in 1649, and then to Scotland the following year; and returned thence with his master; who, after the battle of Worcester, rode into London in triumph, Sept. 12, 1651. He was appointed warden of Merton-college, Oxon, Dec. 9th following, and was incorporated M. D. of the university, Jan. 14th the same year. Cromwell was the chancellor; and returning to Scotland, in order to incorporate that kingdom into one commonwealth with England, he appointed our warden, together with Dr. Wilkins, warden of Wadham, Dr. Goodwin, president of Magdalen, Dr. Owen, dean of Christ Church, and Cromwell’s brother-in-law, Peter French, a canon of Christ Church, to act as his delegates in all matters relating to grants or dispensations that required his assent. This instrument bore date Oct. 16, 1652. His powerful patron dissolving the long parliament, called a new one, named the Little Parliament, in 1653, in which the warden of Merton sat sole representative of the university, and was appointed one of the council of state the same year. titnony of Wood, who was bred at Merton, and always mentions Dr. Goddard, as warden, in terms of kindness and respect. He was, indeed, the first patron to that antiquary; who, as such, dedicated his brother’s sermons to him. published in 1659, and sent it him to London, bound in blue Turkey, with gilt leaves; as we find it carefully set down in the history of his own life, published by Mr. —Hearne. He then removed to Gresham college, where he | had been chosen professor of physic on Nov. 7, 1655, and continued to frequent those meetings which gave birth to the royal society; and, upon their establishment by charter in 1663, was nominated one of the first council. 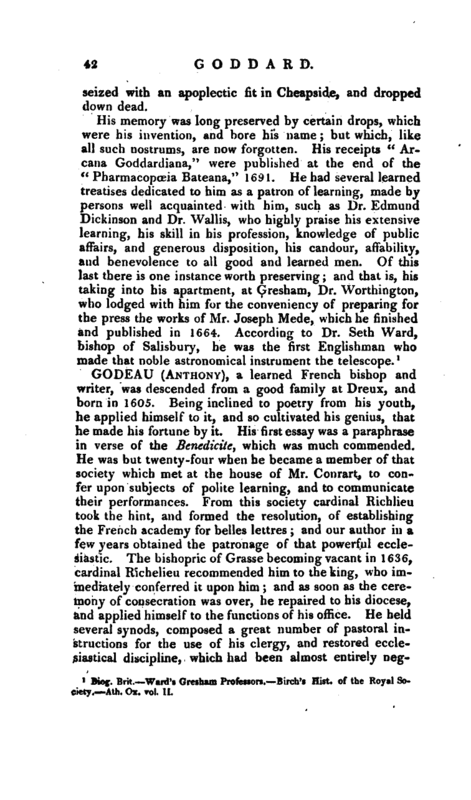 This honour they were induced to confer upon him, both in regard to his merit in general as a scholar, and to his particular zeal and abilities in promoting the design of their institution, of which there is full proof in the “Memoirs” of that society by Dr. Birch, where there is scarcely a meeting mentioned, in which his name does not occur for some experiment or observation made by him. At the same time he carried on his business as a physician, being continued a fellow of the college by their new charter in 1663. Upon the conflagration in 1666, which consumed the old Exchange, our professor, with the rest of his brethren, removed from Gresham, to make room for the merchants to carry on the public affairs of the city; which, however, did not hinder him from going on with pursuits in natural philosophy and physic. In this last he was not only an able but a conscientious practitioner; for which reason he continued still to prepare his own medicines. He was so fully persuaded that this, no less than prescribing them, was the physician’s duty, that in 1668, whatever offence it might give the apothecaries, he was not afraid to publish a treatise, recommending it to general use. This treatise was received with applause; but as he found the proposal in it attended with such difficulties and discouragements as were likely to defeat it, he pursued that subject the follow, ing year, in “A Discourse, setting forth the unhappy condition of the practice of Physic in London,” 1669, 4to. But this availed nothing, and when an attempt was made by the college of physicians, with the same view, thirty years afterwards, it met with no better success. In 1671 he returned to his lodgings at Gresham college, where he continued prosecuting improvements in philosophy till his death, which was very sudden. He used to meet a select number of friends at the Crown-tavern in Bloomsbury, where they discoursed on philosophical subjects, and in his return thence in the evening of March 24, 1674, he was | seized with an apoplectic fit in Cheapside, and dropped down dead. Biog. Brit. Ward’s Gresham Professors. 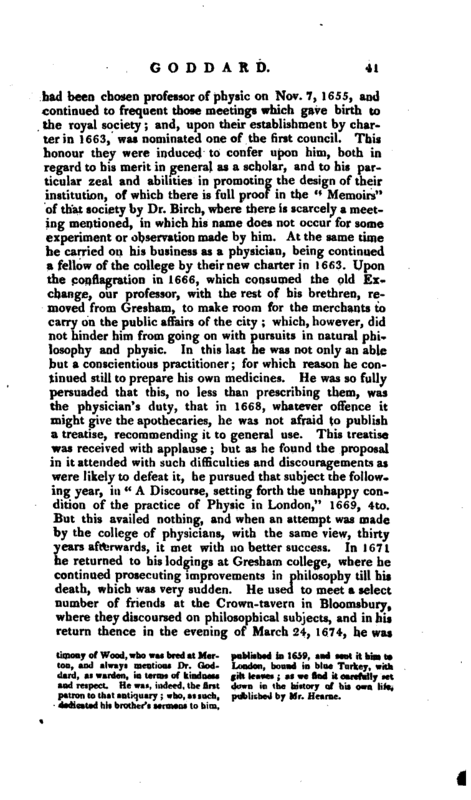 -Birch’s Hist, of the Royal Society, —Ath. Ox. vol. II.